The rising focus towards increasing business efficiency and offering improved customer satisfaction is certain to augment restaurant point of sale (POS) terminals market size in the forthcoming years. Of late, POS systems have advanced rapidly and have been offering businesses improved flexibility, control and intelligence than ever before. Restaurants are constantly shifting from traditional cash registers and fixed credit card readers to iPads, mobile or cloud-based POS systems, technologies that provide businesses with additional features as well as keep track of all data and transactions in a single system. The advancement in Android and Apple mobile devices along with the growing trend for new online payment methods will further drive the restaurant POS terminals market in the years ahead. In addition to credit cards and cash, customers are nowadays opting for mobile payment options and gift cards, making it essential for restaurants to cope with the skyrocketing trend. With POS systems, restaurants will increasingly be able to accept payments as well as process orders directly at the table, further reducing or eliminating the need for waiters to travel between tables and a stationary terminal to register orders. This would also significantly boost staff efficiency as well as table turn times, further increasing guest satisfaction since customers generally prefer tableside bill payment over waiting for paper checks and card processing. In consequence, this would translate to commendable returns for the overall restaurant POS terminals industry. Restaurant point of sale terminals industry contenders in recent times have been working to develop highly efficient software solutions that can be integrated with payment terminals to lend support to numerous processes – viz., accounting, sales, order management, book-keeping, etc. On this note, it is vital to mention that the impact of the cloud has been felt tremendously across the overall restaurant industry lately. With cloud-based POS terminals, restaurant owners can easily gain access to activities such as records and backend processes across stores all by using a mobile device. This unprecedented degree of visibility offers a whole new level of management control to restaurant owners. POS terminal developers, in order to tap the expanding scope of the cloud, are increasingly focusing on cloud-based technologies to offer enhanced features. For instance, Breadcrumb, a cloud-based restaurant POS system developed by Upserve, allows users to quickly search items on the menu, split checks, track server performance, process online and tableside orders, track top-rated menu items, and even allow owners to train their new employees. Technological advancements such as these are certain to further drive restaurant POS terminals market growth in the coming years. Elaborating on the geographical frame of reference, irrefutably, North America has left its regional contemporaries behind as far as the expansion of the global restaurant POS terminals industry in the continent is concerned. The growth of the restaurant POS terminals market in the region can be aptly credited to the rising number of fast-food joints coupled with increased consumer spending. Countries including Canada and the U.S. are experiencing an increased number of food outlets to cater the high consumption rate of the fast food items among its citizens. As per the National Restaurant Association, in 2017, the U.S. boasted of housing close to a million restaurant locations, while Canadians spent around USD 54 billion at bars, cafes, and restaurants. Food outlets have also seemingly adopting innovative technological solutions to provide customers with flexible payment solutions, further pushing North America restaurant POS terminals market trends. Powered by the rapidly increased expenditure on food joints and the expansion of the food away from home industry in the continent, North America restaurant POS terminals market is anticipated to traverse alongside a highly remunerative growth map in the ensuing years. One of the more recent trends making a mark on the restaurant POS terminals market is CRM. As a matter of fact, POS systems integrated with advanced CRM (customer relationship management) solutions are predicted to help businesses increase sales and boost revenue. Of late, restaurants have been using POS systems on a large scale to automatically capture and store guest contact information, including phone numbers and email address, along with their food and drink order history. By applying CRM however, restaurants can create a strong database of customer profiles which serve as the basis for launching targeted promotional discounts and generate rewards points, the results of which can offer increased customer loyalty, ultimately increasing sales revenue of a restaurant. In the decades to come, POS terminal systems are expected to be incorporated with even more advanced features like cloud-sync, compatibility to credit card and mobile payments and CRM solutions, that would offer major convenience to both restaurant owners and consumers. 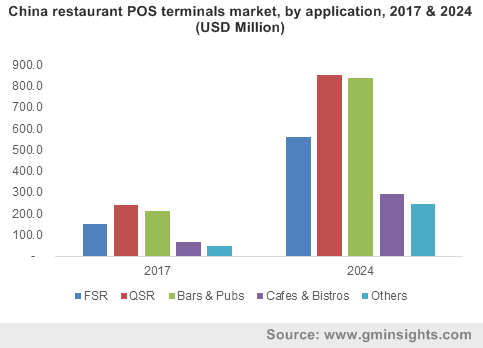 Endorsed by the rising number of restaurants across the globe and an ever-growing tech-savvy customer base, restaurant POS terminals market size is expected to cross USD 25 billion by 2024.